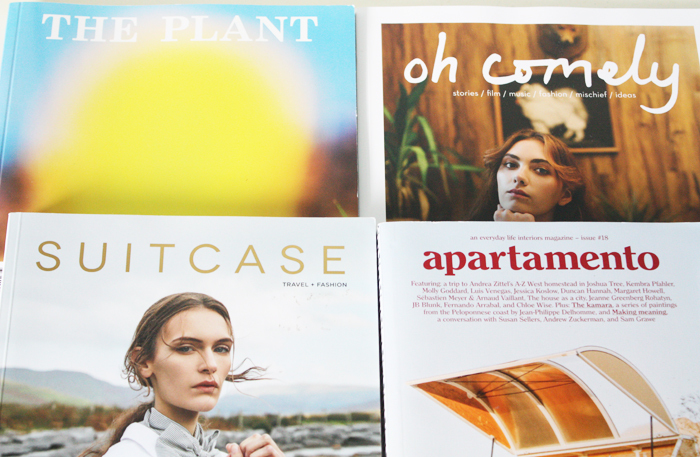 Magazines are my one and only, my ride or die. That's no secret to anybody that knows me, or anyone who has read this blog long enough. I'm sure like many of us, I spend a large portion of my days looking at screens and unwinding with a magazine and the knowledge that my phone is off are some of my greatest pleasures. You just cannot beat a magazine, on paper, especially if it's that thick stock some publishers love. Shout out to Frankie, The Plant, et al. Being a magazine lover means I am always on the lookout for new magazines, or magazines that aren't exactly new but are to me. Today I have four of my recent finds and loves to share. They're all a bit niche and are very exquisite. Oh Comely: I actually came across Oh Comely when I was in London, centuries ago in 2010 and I recently discovered that my local newsagent sells it. Admittedly, waiting months for it to arrive is a bit of a nuisance, sea freight is the bane of my magazine loving existence. It is worth the wait though. Oh Comely is a British magazine, published bimonthly that follows a theme and is filled to the brim with fashion, photography and art by talented people, usually ladies. Recent issues have focused on things like magic and strength which let's be real, the world needs a heck of a lot more of. If you're a fan of frankie then I think you will love this. Where to find me in NZ: Mag Nation, Ponsonby*, Paper Power. Apartamento: This purchase was inspired after I dragged a friend to Mag Nation here in Auckland, and because I saw it on Albertine's Instagram and she has great taste. It is a largely interiors themed magazine but it is also for individuals "who are passionate about the way they live". Unsurprisingly, this publication, released biannually is impeccably designed. Alongside captivating imagery are engaging articles with creative people about their spaces and art. It's a bit on the pricey side here in NZ but it's perfect if you're into aesthetics and want to treat yo'self. Where to find me: Mag Nation and Magnetix, Wellington. Suitcase: A tome of travel and free-spirited goodness. Suitcase first came to my attention via Amelia who if I am remembering correctly, used to be one of their contributing editors. Suitcase is the perfect size to fit into your travel bag of choice and is a travel magazine you will want to read. This may be a potentially unpopular opinion but I feel like most travel publications, the ones I've seen at least, veer on the dull side of things but Suitcase is thankfully far from dull. Published quarterly, each issue is usually themed around different countries and cities. The one pictured was interested in the idea of myths and legends+stories from faraway places. It contained a writeup on the legends and lesser known secrets of Oxford by Rosalind Jana, a handy guide to beauty products 100ml or under to take on your travels and photographic explorations of national parks in America, the mystical landscapes of Scotland and more. It's fairly inexpensive, I want to say it is $15 or less here in New Zealand which for an imported magazine is pretty decent, so I recommend you nab a copy. Where to find me: Mag Nation and Magnetix. The Plant: This time, an Estee inspired acquisition. Side note: her love for magazines rivals mine so I suggest you head to her channel where she shares recommendations from time to time. A magazine for all the greenery lovers and a place where creative people+their love of flora and fauna come to party. Well not party, more like share their magic on paper. Each issue is themed around a particular plant, the one pictured was inspired by geraniums. Again, this is a beautifully presented and designed publication. I can't seem to find information about how often it is released, it seems to be yearly though. Where to find me: Mag Nation, although because this one is a bit more elusive you may wish to contact them first before heading there. -What magazines do you read and like? *For clarity, I was employed by Mag Nation in late 2015-early 2016 but this post is in no way affiliated with them and I am in no way advantaged by linking to their website. -Hello y'all, it's me essentially talking to myself because apart from Emma (hi Emma), I don't know who else reads this section. I just wanted to share a little PSA and say I am going to be a bit absent from this blog now for a week or so. I have a giveaway scheduled to go up early/mid next week but otherwise I will be in full on assignment mode. Fun times and if you want to learn the phonetic alphabet with me, please sing out. On the plus side, next week is Adele week so that will help the assignment cloud lift. What else..oh, I have a new story on FashioNZ of some Autumn beauty must-haves, including several that haven't made their way onto this blog yet. That's about all for now really. I hope you are all having a great month thus far.